Kitty Jewelry Page 1 - Welcome to my jewelry site with designs for femme and feline! Congratulations! You've found the shopping area! Here is the first collar page, chock full of beaut-ious collar creations for your kitty! Take your time to look around! And remember.....The collar you see, is the collar you get! Right now the photos are examples, I am still to set up shop, sorry. Wow! This is one bright collar! I love the combination of hot orange and hot pink! It kind of looks like it is made of bright Jell-o cubes! Yum! Or Kool-aid! Great! Now I'm hungry! 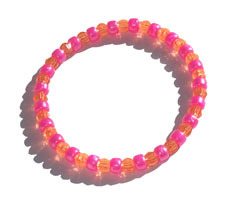 Made of hot pink solid color crow beads and orange clear facets. What kitty wouldn't feel special in this necklace? It glows golden in the sunlight! Extremely sparkly! 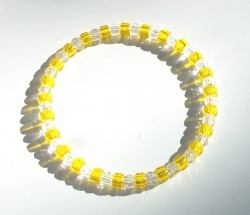 Made with yellow crow beads and clear faceted beads. And, as always, no glass materials and thick elastic! Woo-hoo! I love the combination of stripes, sparkles and pearl white beads on this piece! This necklace will go with anything! Looks extra lovely on those kitties with dark hair! 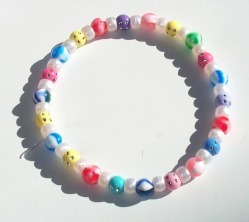 Blends with lighter colored fur, making the beads look like they are "floating"! Very cool! I LOVE these colors together! I HAD to make a watermelon necklace! My favorite summertime treat! So bright! 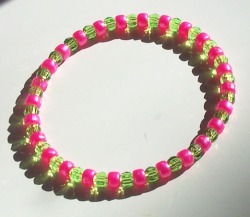 Made of hot pink pony beads and green faceted pony beads. Sized for the larger kitties, like Tuk Tuk!